For convincing me to go. Believe it or not, it did take a little bit of encouragement, I was initially hesitant. School started last week and so I’m missing the first couple of days. On top of that I had just come back from Japan not too long ago, and my money supply was more than a bit limited, heh. It didn’t take too much prodding however; I mean, how could I pass up the opportunity? For setting this all up for me. Filling out and sending in the applications, waiting on the mail to deliver the various documents you needed from me, answering my questions. I could go on an on, but I’ll just say that I am very grateful for everything that has been done for me to get me here. Then there’s the friendly and helpful staff, to everyone involved. Thanks all. Now, if by the title of this post it’s not obvious as to what it is that I’m talking about: I got to go to the Berryz Kobo Fanclub Tour in HAWAII! Or I guess, technically I’m still here, but the main events have since concluded. I had intended to keep this really short but, no matter, I just wanted to share some of my experience. First, before I get to the event itself, we were to choose a Beri Hello Name for ourselves. The Beri Hello Name is basically a nickname for use during the event. I was thinking I’d choose “solo” but that just wouldn’t do, yeah. I decided on “Kentucky.” This is an interesting one, because Kentucky is short for Kentucky Fried Chicken (KFC) in Japan. An intentional setup for Kenchiki jokes. It also setup an interesting scenario where when people would ask where I was from, my answer of course would be, Kentucky. Clever little thing I did there methinks, most seemed amused by it anyway. So that’s where the event starts. We’re outside divided into 23 teams of 10, under four separate pavilions, situated around an open area. Berryz come out, say hello and do their introductions. They each have their own Names too. Captain’s Name for example, is “Saki.” At first I was like, what? LOL. She wasn’t the only one to do this tho. In the end it makes sense, and they did explain their choice. Captain is Captain, so Saki fits. Let’s see, Yu-chan, Momo-chi, Na-chan, China~mi, Risako, Maasa. Yeah, I know I have a few of those wrong (also, excuse me switching between the different names throughout the writeup). With Berryz names out of the way, it was time to take role. Each one of the girls would grab a random group of 30 names and head over to the tables. They’d read off the names one at a time, and each person would respond “Hai.” At the end of reading off 10 names for the people at the particular table, they were presented a gift of some photos and some red thing that folded out that nobody could figure out what it was (tho, it’s use makes sense later into things). Risako came to my table. I believe she recognized me from the last two Berryz concert tours. Where in the one she smiled and waved back at me, and in another I had done something creative with one of my glowsticks that got a chuckle out of her. In any case, this would be I guess, my first time “meeting” someone from Berryz Koubou. With the roll complete, it was time to play some games. Each fanclub member would have a chance to grab an envelope, and interact with one of the girls in the form of a game of jankenpon or to answer a trivia question. Win or answer the question correct and you’d get a point for your team. When I went up I was directed to Risako where she asked me a trivia question. Uh oh, heh. She started reading the piece of paper I had handed her and all I could make out of it was something about August twenty something and otanjoubi. My answer was Miyabi, but that was wrong, LOL. Anyway, I wasn’t the only person in my team to get a wrong answer so it’s not like I let us down or anything, hehe. The next game was a water balloon toss. Pretty simple really. Berryz would toss you a water balloon, catch it and you get a point for your team. At the end of the bought of games, a winning team was announced and they got some candy leis. They were called to the stage and Berryz presented it to them. Berryz had decorated a largish canvas, not as big as the one last year, but a similar type thing to give an idea; they brought it out to show everyone. And now, each of the 23 teams also had a canvas of their own to decorate. 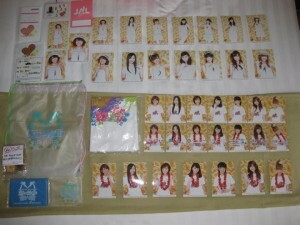 During the decoration process each Berryz member would come around and give the team one of a myriad of stickers they had designed. Giving me a chance to meet the rest of Berryz. Of note is when Momoko came to our table and she was asked by someone in my team to put her sticker on the back of the canvas. She was not happy, tho in a playful type of way. With Berryz finished distributing their stickers, they would then exit in the direction they came in, leaving us some time to finish decorating our canvas. As they’re walking out, waving to everyone, Chinami is taking her time strolling along. She then stops to say something to the camera and so is the last to leave. I maneuver myself so that I’m in open view of the exit. “Chi-na-mi,” I shout out, which grabs her attention. “Bye, bye,” I say. She waves, smiles and returns the byes. “Nice shout,” &c is told to me by the wota in the pavilion, an encouraging bunch they are. As the teams were finishing up their canvases, a group of wota came over to my teams table to say hi. A couple I had seen before, but otherwise they were all new faces to me. Anyway, we chatted a bit. Thy asked about my interest in the group, about my tattoo (which they brought up, knowing of it from others) and such and such. Just to restate, what a cool bunch of people these guys and gals are, yeah. Canvas is finished, so it’s time for a group shot. We take or canvas up a hill where Berryz are now prepped and waiting. My team reorders themselves so that we’ll all be standing in front of or favorite members. Picture shot and it’s on to the next planned happening. First in the service line was Risako, who handed out the plates and a fork. Second was Na-chan with a hot dog bun. Saki, with the hot dog. When I got to Saki, she pointed out my name, Kentucky; at which point Miyabi leaned over to read my name tag as well. Next up was Momo-chi with a handful of curly fries, “Kentucky-kun” she said in a really cute voice. Yu-chan dropped some salad on and off my plate, hehe, before I moved on and Maasa topped off the salad with some dressing. At the end, Chinami handed me a drink. When I got to Chinami she repeated “Kentucky” as the others had before her. She said it a few times actually. I replied “Hai, Kentucky” and pointed to my name tag, “Kentucky ni sunde imasu.” Now, an interesting thing happened when the other wota, both in line behind me and those back in their seats saw me talking with Chinami. They started to clap and cheer, haha. Amusing. We were given a little bit of free time, before moving on to the next spot. In reference to that red thing I mentioned earlier. It was like a little seat cushion thing. The people in the front rows would be sitting on the ground so we eventually put two and two together. Question and answer time. We all got the chance to fill out a form with a question on it, where the girls would pick one out and answer them. They only did 7 tho, so you were lucky if your question was picked. When your question was read, they’d shuffle over to that side of the group and read it to you up close. Was cool. One thing I thought I’d mention was that as Momo-chi did that cutesy thing she does (Momo, just being Momo, heh) Chinami does that thing she does, where she’s kinda like not really annoyed, but rolls her eyes at it. I find the Momo/Chi interaction lately with regards to that interesting to watch (and as I’ve mentioned elsewhere, it’s not just Chi who kinda picks on Momo either; it’s all in good fun anyway). After the question and answer, we were treated with a few songs before moving on to the next bit of this event. Curiously, Chinami went missing from the group. Kumai then went on to lead the wota in prayer… or some sort of ceremonial, something… hmm. Obviously I’m not completely sure what she was saying (and I say prayer, cause that’s just what the atmosphere felt like), but the other wota seemed a little bit surprised before she started, but then all calmed and became still as she began speaking. As she finishes up, Chinami is back. Chinami the fire god! She’s in a sparkly pink costume, with a little wand with pink streamers hanging off of it. They do a little bit of talking and then Chinami replaces the pink wand with a long dowel, with a lit lantern at the end. She proceeds to the bonfire (assisted by a bunch of staff) and lights the fire. With the fire lit, it’s time for some more songs (I should mention, we also sang Happy Birthday to Miyabi, who was surprised by as we started off). This time as they’re singing, they’d circle around the fire a few times, facing the crowd. Periodically some of the water park staff had been adding more fuel to the fire, as it wasn’t all that impressive. It would peak up for a short while but then die down a while later. That is until, WOOOSH!!! The thing takes off like mad, sending the girls running and screaming. The music keeps on anyway, and eventually the girls start another round of circling the fire, coached on by the staff. Chinami was having none of that tho, the fire god was too afraid of the fire to approach it again. The other girls were all pretty hesitant as well. It was nice and exciting experience anyway. As thing were winding down, Berryz were walking off the “stage” and to the side where some lights and a table were setup. High-Five time! On our way back to the bus, we lined up to give each of the Berryz a high-five. They really hurried people through the line this time. I was determined to go a little bit slower tho, heh. I allowed a little gap in front of me and made my way through. When I got to Chinami her and I exchanged three high-fives, haha. She had something written on her hand, tho I couldn’t make it out. “Ohayou Gozaimasu~” We were greeted as we entered the conference room, by Berryz who were on stage. “Ohayou Kentucky-san,” Chinami had a personalized greeting for me as I walked by. I feel special. They were also handing out maps, places we should visit, places they recommend or something to that effect. For my 8 shot I did nothing special, the Shaka sign. Chinami was in the center of the photo tho too, right behind me. The shot turned out well I think. I was the last in my group to go up so I did have a little bit of extra time to turn and say bye and thank you. After this we were sent off before we were to regather for the concert later that afternoon. No play by play of the concert, but there were a couple of things I wanted to point out. One was the rain. Even with sunny skies we’d periodically get bouts of light rain coming down. Berryz were prepared however, as they went around to the back of the stage and grabbed some water guns! They were shooting each other as well as the audience. Good fun. Saw a couple of rainbows, one that came out right at the end of Seishun Oodori, which seemed wholly appropriate. Mixed in with the Berryz songs were a couple of the covers from their Summer mini album. Chinami, Yurina and Miyabi with Chu Natsu Party. Risako solo (Risako’s outfit …), Yeah! Meccha Holiday. While Captain, Maasa and Momoko wrapped up the mini groups with Halation Summer. An enjoyable concert despite the heat that started things off and the rain that ended it. Not gonna say much more than that, to keep it as kinda a special thing between me and each one of the girls, you know? Tho I will mention, as I have seen some discussion on 2ch about it, that Chinami’s loud and animated interaction with me at the time really put the icing on the cake to the whole event. While things end here, it has created so much lasting memory.